Patrick E. Geraghty, of counsel | Geraghty, Dougherty & Stockman, P.A. Patrick E. Geraghty is a licensed Florida attorney practicing in both State and Federal trial courts in Southwest Florida, concentrating in the areas of commercial litigation, federal civil rights litigation, real estate and probate litigation, and personal injury and wrongful death litigation. Mr. Geraghty is certified by The Florida Bar as a specialist in civil trial practice. He has been voted by his peers as one of the Super Lawyers in Southwest Florida in 2010, 2012, and 2013. Gulf Shore Life voted him one of the go-to lawyers in Southwest Florida in 2007. In 1995, Mr. Geraghty was inducted as a fellow in the American College of Trial Lawyers. He is also a member of the National Board of Trial Advocacy, as well as The Florida Justice Association and the American Justice Association. 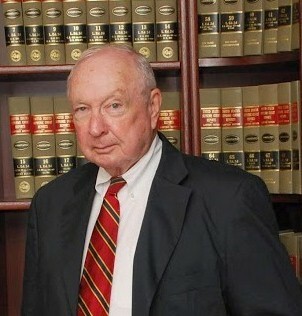 Mr. Geraghty has chaired The Florida Bar’s grievance committee, as well as serving as the Chairman of the Judicial Nominating Commission for the Twentieth Judicial Circuit from 1978 to 1982. He is an emeritus member of the Caloosa American Inn of Court. Mr. Geraghty’s community service has included serving as a Commissioner on The Florida Marine Fisheries Commission from 1992 to 1999, Vice Chairman from 1997 to 1998, Chairman 1998 to 1999, and Chairman Pro Tem, Florida Fish & Wildlife Conservation Commission 1999. He is presently Chairman of the Coastal Advisory Commission of Lee County, Florida and emeritus member of the Law Center Association Board of Trustees, University of Florida, College of Law. Additionally, Mr. Geraghty is the past Chairman of the Lee County Southwest Florida Federal Bar Association from 1990 to 1991. Mr. Geraghty attended the University of Georgia and Marquette University on football scholarships and graduated from Jacksonville University in Jacksonville, FL with a degree in history and English literature. He received his law degree from the University of Florida College of Law. Mr. Geraghty was admitted to The Florida Bar in 1969 and is a member of the United States District Court, Middle and Southern Districts of Florida, and the United States Supreme Court.